Sometimes you want to do awesome nail art but you just don't have the time to sit down and do something complicated. Or maybe you're just starting out in the world of nail art and feel a little intimidated by all the techniques and tools (understandably!). 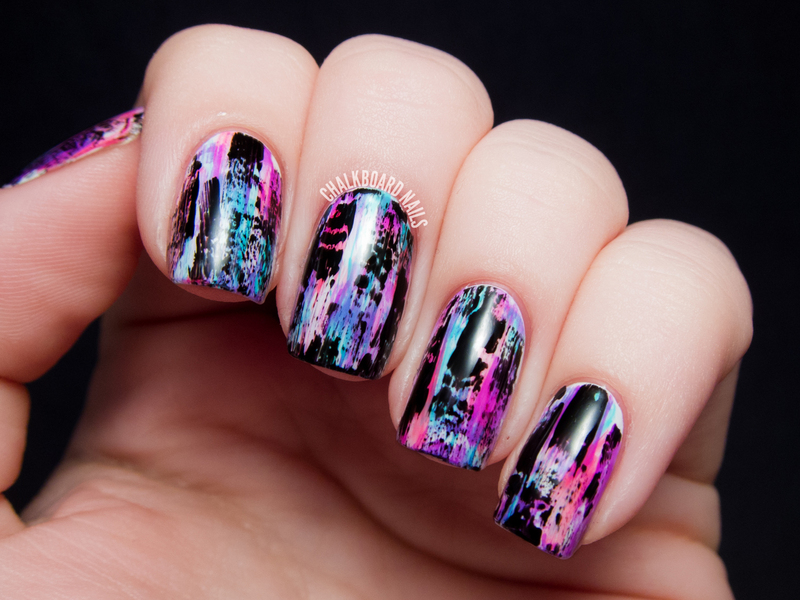 Perhaps you just like edgy nail art that can be swiped on in seconds. No matter what your situation, I hope this nail art tutorial speaks to you. You don't need any special tools, and imperfections are totally encouraged. Pick a few colors, grab a black polish, throw caution to the wind, and let's get started! I originally debuted this effect during the 31 Day Challenge and later did another version in neons. Today, I'm tackling the style in bright, girly shades, and this is my favorite version yet! The gist of this technique is that you wipe almost all of the polish off of the brush and then use the almost-dry brush to apply uneven swipes of polish. Be sure to watch the video tutorial to see it in action! I really like this style. It's so fast to do, creates really eye-catching results, and looks great in all sorts of color combinations. I've had a couple people mention that it creates a look that is similar to the effect you achieve with a shatter polish. I totally agree, but I think this technique has the upper hand! Doing this distressed effect by hand lets you control how much black polish goes on top and where it ends up. 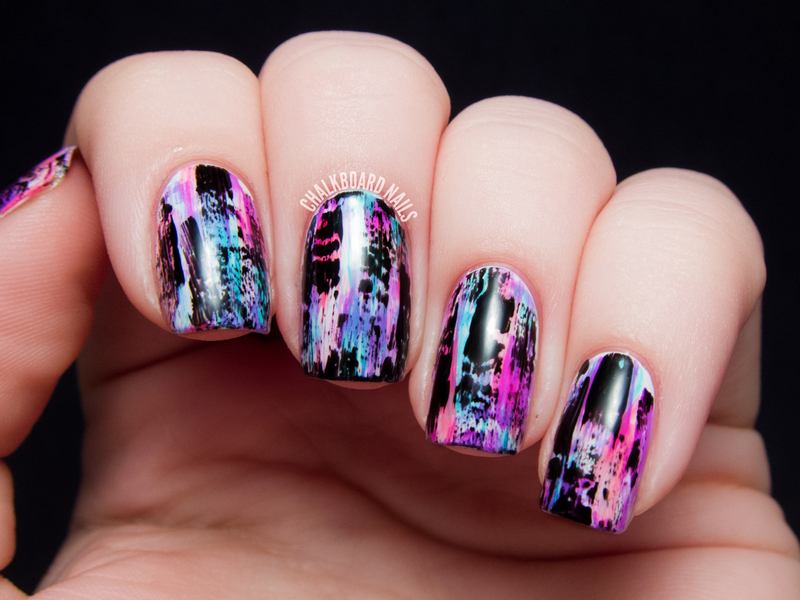 Shatter can be inconsistent and will oftentimes cover up all the beautiful color work that you put underneath it! Think of this as shatter for a more refined audience. So what do you think? Will you be giving this beginner nail art technique a try? Come share your results on my Facebook page or by hashtagging #hellochalkboardnails on Instagram/Twitter! Love love love! Great tutorial! Ah I admire your photo skills greatly! They're so bright and clear! Loved the tutorial. Simple but so so cool. Great tutorial! This is my favorite one of these you've done yet! WOW Gorgeous! I am so going to try this! :) Thanks for the great tutorial! Absolutely love this! Looks easier than I anticipated! I haven't done much (read any) nail art since the 31 Day Challenge ended... this is perfect! Thank you for the tutorial! Sarah, this tutorial is amazing! I am so making these distressed nails :D Thank you so much. Great video! Shatter for a more refined audience...I love it!! This is such a cool technique; thank you so much for sharing it! So cool I have to try it really soon. Thanks! Es muy lindo, como el efecto craquelado, pero con pincel! The next time I'm throwing caution to the wind I am going to try out this manicure! :) Thank you for another great tutorial! I think I tried something similar to this once, but after seeing this I'm gonna have to give it another try. Cause yours is fabulous. They look amazing! I'll definitely have to try this out. Amazing, will definitely try this out! great tutorial, i love this look! The key, with any topcoat, is to get a good bead on the end of the brush, and then float it over the nail. Try not to touch the actual nail art with the bristles! GREAT tutorial, and I love your voice, it's comforting to listen to :). Seriously one of my favorite nail arts of all time. Thank you so much for sharing! Amazing nails! So gorgeous, definitely want to give this a try!! I'm so glad to hear you have been enjoying it! I agree -- the end results are totally misleading because they look so complicated! 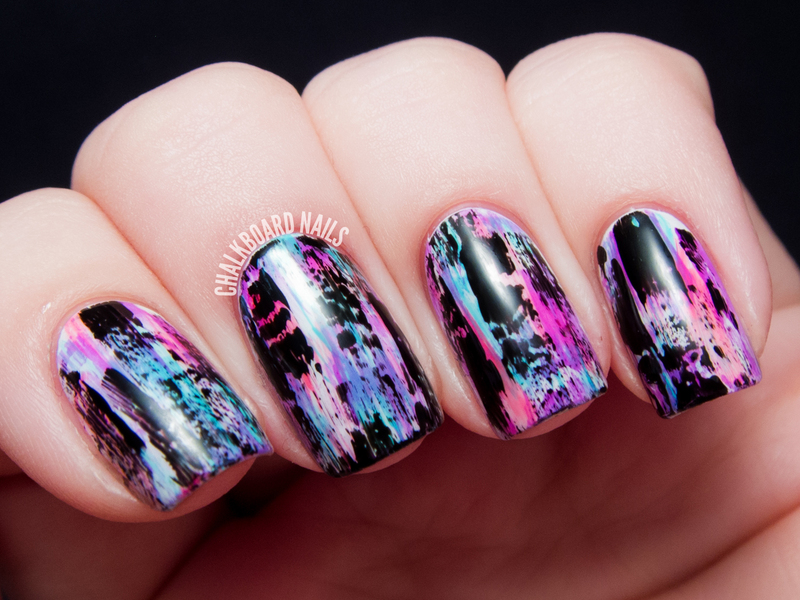 Holo distressed nails sounds fun, I will have to try that sometime! Lately I have been using Essie Blanc but almost all white polishes are finicky regardless. Many people like OPI's Alpine Snow. Thanks for posting the link to this tutorial yesterday in the Polish-aholics Anonymous group. It's right up my alley, as in, it's simple and easy. Love it! But what's the difference between this & the brush stroke? wow, great idea! sometimes i am at loss at which color to wear (amongst the hundreds on stock); this is a great way to use a lot of them at one go. thanks! Wow, this is such a lovely manicure! I’m trying it today, wish me luck! Okay, so I'm kind of bad at doing all my nails, because my cuticles are really messed up. So I took your idea & did some french tips. Check it out!! I LOVE this tutorial and thank you sooooo much for this idea.